Yesterday, our democraticaly elected president, Hugo of Sabaneta, as usual in cadena nacional (forced TV and radio transmission) wished all of us a Happy 2010. He said that if the bourgeoisie - obviously never meaning his billionaire friends - returned to power, they would desmantle "the achievements of the revolution", that his people have to guarantee we do not lose the majority in the 2010 parliamentary elections" and that if the opposition were to get that majority, they would destabilize the country. So far for his love for plurialism. The National electoral council is working very hard now to define the key electoral districts again in a show of massive gerrymandering. In January we shall find out how they transformed the electoral regions for the most populous states. Two of the council's key members are hard-core chavistas who had previously declared they would do anything to guarantee the success of the so-called revolution. Hugo also announced "major advances" on crime reduction, citing again some magic chavista numbers about people's perception of crime. Never mind the government refuses to discuss openly about numbers on murder rates. Never mind the murder rate in Venezuela was 19 per 100000 in 1998 and now it over 60: crime is, according to chavismo, in the eyes of the beholder. Never mind Hugo of Sabaneta recently announced the national police was getting a 260% rise now as an achievement, as if the government had been elected just some days or months or years ago. Perhaps - best case scenario - we finally see next year a reduction of the murder rate compared to this year, which is not hard given the current numbers, given the fact we have long become South America's most dangerous country. If this were to happen, I am sure the government will announce it as a huge success, even if the rate would still be several times worse than when the government took office over 10 years ago...then people in Venezuela have a very short memory retention span. As the red-very red National Assembly diverted a huge amount of the budget from the municipalities, the states, the Ministries of Education and Justice to be directly controlled and distributed by the president, he will have some cash in hand to impress a bit for election time. He will probably close a couple of very bad deals with the chinese or the Spaniards or someone else to get some fast cash as well. Things will not be easy economically, as even Ow (former chavista) says in his latest post here. Still, the government is the one with the petrodollars and the opposition not. Still, the opposition has to wake up and at least use the few opportunities it has. It does not communicate well. It still thinks it has to talk through Venezuela's FOX version, Globovision, which only reaches the converted. Most of the new opposition leaders are people with middle to upper-middle class background from the capital or the largest cities. It does not matter that most chavista leaders are wealthier than many of those leaders now. It is a matter of perception in Venezuela, at least with voters. Most know Venezuela is highly urbanized. What the opposition leaders and many of their supporters don't seem to realise is that "urban" is much more than just the capital and the other largest 5 cities. As soon as we get out of those regions our influence drops dramatically. We have forgotten the "rural urbans", so to speak. The opposition will need to put its act together with regards to defending the votes outside the major 5 cities during the September elections. Those leaders will really have to move their asses. Below you have a couple of maps about the 2008 local elections. Firstly you have very urban and central Miranda state. Then you have the rural Monagas. 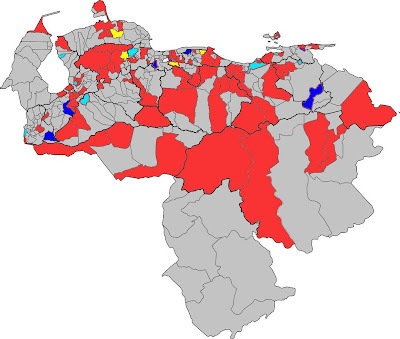 In red you see the municipalities won over by chavista mayors. In blue those the opposition got (kind of, as the government rushed to decrease their resources and competences). The dots represent population (a big dots means 100000 inhabitants, a midle one about 50000, a tiny one some 10000). The third map shows my region, another very central and urban state, with Venezuela's third largest city and one of the main industrial sectors of the country (as far as we can talk about industry in Venezuela). 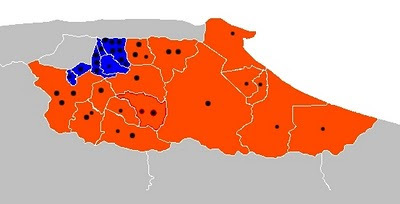 The blue and cyan regions refer to those municipalities where the current opposition governor, Salas, got the majority. The pink and red municipalities are where the other candidate, Mario Silva, won. This is incredible as 1) Salas is well-known and his dad was also governor of the state and 2) Mario Silva is hated even among chavistas. One of the things that happened was that Salas, who comes from a family of people who were players in the local politics already 2 centuries ago, is acting as the usual local caudillo, wanting every other group, including PJ, to accept his candidates. Finally, I put here the start of a Mind Map about Second-in-command Diosdado cabello (aka God-Given Hair, aka Pretty Eyes). He is very linked to billionaire Berrueco, who just recently fell from Grace. Diosdado's Ministry had signed some obscure deals with the Spanish government as Gringo tells us here (and in other places), deals with no public tender and the like. As the electricity problems of the country have become just too much, Hugo of Sabaneta recently passed the control of the electricity industries away from Diosdado to a new Minister, the minister of Popular Power for Electricity, Rodríguez. Let's see what fortunes await Diosdado and the other Second-in-command, Aristóbulo Istúriz, who is capable of anything for the "revolution", but who seems not to be connected to very murky billionaires and deals (as far as I know). In spite of it all, I think we have good chances to avoid the worst and start turning Venezuela towards sustainable development and away from autocrats and other caudillos. For that we must work. In that spirit I wish you a very happy and succesful 2010! 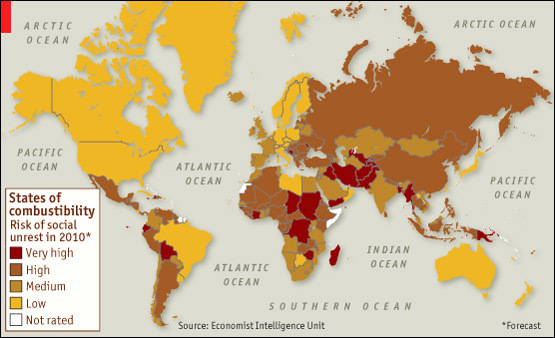 This map lifted from the Economist will do fine to introduce a Latin American forecast of 2010 because it explains a lot. If you observe well, all of Hispanic America is in trouble, besides Costa Rica, Uruguay and Cuba (then again, how could trouble start in totalitarian Cuba?). Flanking that zone of probably social unrest there is the US and Brazil. This last country has decided to take advantage of the relative USA weakness to make a gamble and establish it area of influence across the sub continent. For quite a while I have been writing about Brazil imperialism, US withdrawal, and such things. But when we look at the result of Honduras elections, not the vote count but the reactions around, it seems that suddenly a few cards are falling. The clearer hint comes probably from Uribe deciding to recognize the new Lobo government while a few yards away at the Lisbon summit Lula kept saying that there is no way Brazil will recognize the Honduras vote, just as he was fresh from receiving Ahmadinejad who has killed infinitely more people than Micheletti, and quite deliberately at that. At least on a morality point of view Lula would do better to shut his big mouth. The Honduras election of November, I am convinced, will mark a turning point in the inner politics of our continent and as such are probably the most important event of 2009, the event that unmasked a lot of pretensions and that will explain the major moves of 2010. What has started in the months since Zelaya was ousted is the division of the Americas between the US and Brazil, or rather between the free market democratic economies and the other guys. It is really not a new concept: divisions of the Americas in areas of influence dates from almost Columbus trip. At Tordesillas Spain and Portugal split America on a meridian. That old map below shows that division and also shows how successful was Luso-Brazilian "imperialism". Without neglecting of course other European powers, in particular England who did carve quite a zone of influence, eventually all inherited by the US. It all started indeed when Obama took over and in a nice gesture went all smiles to the Americas summit at Trinidad. He put up with Ortega's insults. He shook hands with Chavez and put up with his show when he gave Obama an outdated book. Obama and his administration genuinely thought that the Latin Americans were hating Bush and that a few smiles would go a long way to ease things. They were wrong. First they noticed that after Trinidad there was really no improvement. In fact Brazil was, if anything cozening up further with Venezuela against the safest ally of the US in the Americas after Canada: Colombia. But the US stayed quiet. Second, there was the OAS summit at San Pedro de Sula which saw the return of the Cuban dictatorship among the "civilized" nations. The US had all the trouble in the world to limit the reunion to a suspension of sanction to Cuba while still demanding that Cuba improves its internal conditions before it could become a full member of the OAS. It was hard swallowing for the US even though Obama had already proved his best intentions toward Cuba through a dialogue. Third there was the Honduras coup. At first the US in a gesture of good will followed the cues of the OAS, that is, punish the small country, expel it form the OAS and wait for the OAS to find a solution. Months went by and the Obama administration learned what other administrations had learned the hard way: the OAS is a club of presidents that would be much happier if there was no US ambassador in its midst. The US got tired and seeing the incompetence and partisanship and idiotic positions of too many within the OAS (and we are not talking Chavez only here), and thus the US decided to move and broker some Honduras deal that they suspected Zelaya could never carry. Zelaya foolishly signed on the deal, did not respect it and allowed thus elections to take place. He has ruined his chances as now the solution will not go through his restoration (which for once, in a rare sign of common sense, he had admitted by "refusing" to return to office even if the outgoing Honduras Congress had voted his return). But Honduras is only the more apparent sign of the fight for America's control between its two giants, Brazil and the US. True, in Honduras the heavy and very clumsy hand of Brazil was to be seen everywhere, even before it allowed Zelaya to use its embassy. The fact of the matter is that Brazil attitude toward the US has changed considerably since Obama was elected. I suppose that before Obama's election Brazil did not worry much thinking that Bush could really not threaten its growing influence. That Brazil was so confident was seen when it received Bush quite well to discuss the future of ethanol. However when Obama came into office he, who was supposed to be a natural ally for a socialist Brazilian president, was seen in fact as a threat. First, Obama did not sign an FTA with Colombia, but kept the close relation with the country, a close relation which keeps intensifying with the permission by Colombia for a few hundred US technical personnel to be permanently based in selected Colombia bases to monitor drug trafficking and Chavez bellicosity. Can an FTA be that far behind? Second we must note that during all the UNASUR inner conflict that followed that US-Colombia agreement we never saw any serious understating of Colombia's problem by Brazil. That is, Lula has always been complaining about the bases but never we did heard a true statement of support for Colombia fight against the terrorist FARC, and even less about the open support of the FARC by Venezuela. The partiality of Lula speaks volumes. UNASUR is Lula creation, an instrument through which Brazil would become the umpire of South America conflicts and through which Brazil could exert an increasing control. For Lula, the founder of the Sao Paulo Foro, it was also a security system that would consolidate the left supremacy over South America where the only country with an open center right government is Colombia. Things were going well for Lula and he could advance in his plans without being too obvious. But that worked until this year when the election of Obama coincided with the renewal of the Colombia-Chavez conflict. It is important to note that I write Colombia-Chavez conflict instead of Colombia Venezuela because there is one important detail that pundits tend to forget only too easily when they describe the situation: Uribe has certainly his own political interests at stake, but he has also those of Colombia in mind, and they are his priority. 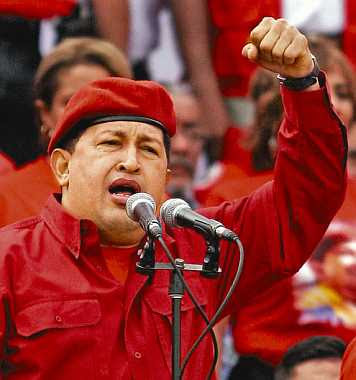 Chavez has only his personal interests at stake and all that he does against Colombia is actually hurting Venezuela. We must look first at Lula new found ego. With high popularity as he finishes his second (and last?) term in office he wants to leave with a bang. He has thus forgotten the wiser counsel of his foreign experts at Itamaraty palace and put his diplomatic legacy into the hands of a leftist hack, Marco Aurelio Garcia (and friends). For some reason these guys have decided that the time was right to make a continental move. Chavez is under control: the extent of Venezuela debt toward Brazil allow this one to use Chavez as a scarecrow whenever it is needed. Chavez check book also allow for the indirect control of the ALBA country, from Cuba to Bolivia. MERCOSUR is comprised by two small countries already under the Brazilian orbit and a big one half bankrupt which cannot afford to alienate Brazil. Only Chile, Peru and Colombia escape the Brazil orbit. Peru is still too politically weak to be of any threat. Chile is just too far, clinging to Andes to avoid falling into the ocean. There is only Colombia left to challenge Brazil in South America; but a Colombia which has the best trained army in the Americas after the US one; a Colombia which economy has been steadily growing; a Colombia which has a strategic position and a climate wet enough to become an economic power at some point the more so as Venezuela is self imploding. And more importantly, a Colombia with the support of the US even when an administration changes as radically as it did going from Bush to Obama. There are many reasons why Colombia is under such pressure this end of year, including the vile assassination of one of its local governors. But all, from Brazil to the FARC and Chavez, know that Colombia must be stopped A.S.A.P. because time is running for Chavez and the FARC and that a post Chavez administration could well abandon Brazil and reconcile very fast with Colombia. Of course Brazil cannot go much further than being unfair at UNASUR when Colombia is discussed. But Chavez for domestic reasons and the FARC for the survival reason seem decided to go to the bitter end and do Lula's dirty work. Due to its mercurial leader and its interior complicated situation Venezuela, or rather Chavez, will appear as more of a threat to many, and a saboteur regime to all. Chavez has suffered two major defeats this year: he lost its Honduras colony and he lost his seemingly bottomless check book. Thus no new friend has come to join Chavez gang and even some of the gang as Correa or Lugo are questionable. For Venezuela 2010 will be a time of reckoning and as such Chavez foreign actions will reflect his troubles at home, the graver those, the more strident or violent Chavez risks to become when faced with Colombia or the US. Heck, even the little Netherlands have been threatened by Chavez! Why is the Honduras defeat so bad for Chavez? Although the Honduras situation is far from settled, the actors that started the tragedy, Zelaya and Chavez are going to fade as new actors will take over and try to benefit politically of Honduras troubles. Thus no matter what, Honduras remains a major setback for Chavez. In fact it is much worse for Chavez than what you may think at first. The intemperate actions of Chavez and Brazil through the OAS have probably alienated Central America as a whole. These countries do not depend at all for their prosperity from Brazil, and little from Venezuela besides cheap oil. There is thus no reason for these countries to put up with the bullying of Lula and Chavez. Panama and Costa Rica are already all but in open disagreement. Honduras, never mind! And Guatemala and Salvador, in spite of their left office holders have been careful in marking their distance. Nicaragua is weakening fast and Ortega retaining office looks everyday more of an uphill battle. And Mexico, to the great surprise of many, is seeing a PRI becoming the next political option as the PRD slowly implodes due to the naked ambition of its leaders. A putative PRI administration will neither be pro Lula nor pro Chavez: it will be pro Mexico. The ripple effect of Tegucigalpa goes from Mexico City to Panama City. The issues here are simpler: all are waiting for Fidel's death to see how the chips fall. Cuba is bankrupt and survives courtesy of its colony: Venezuela. None of the other countries is important or prosperous enough to have a role except for Trinidad and Barbados who are already distanced with Chavez. The Dominican Republic plays an ambiguous role but it has nothing to fear from anyone: an island offers security advantages to play "dare". And none of them, except somewhat Cuba and Haiti, depend from Brazil. For all of its useless intervention in Tegucigalpa, Brazil is finding the hard way that its influence and arm twisting power does not reach Panama City or Port of Spain. And thus we return to South America, the area Brazil should not have left. Argentina should be a major player but more than half a decade of Kirchner rule is bringing all of its internal contradictions leaving still the country in the edge of bankruptcy. With the opposition gaining a congressional majority this month things are going to become more difficult for Cristina Kirchner. Argentina is probably going to be, by necessity, the biggest enabler of Brazilian ambitions for the time being, probably more so than Chavez who is in many aspects a mere tool of Brasilia. Uruguay and Paraguay are too small to have a significant effect. Or do they? Paraguay holds the key to Venezuela's entry in Mercosur and one is allowed to suspect that it fits everyone just fine that Paraguay is nowhere close to welcome Venezuela. See, the divide between the troubled Lugo presidency and a seante that laready thinks about a post Lugo era gives unexpectedly a bigger role to Paraguay than expected. Uruguay is an enigma. An ex-guerrilla as its new president all is possible, the more so that his coalition is not as united as people think and his election was more difficult than expected in spite of the good Tabare years. But does Uruguay matter much today? Ecuador and Bolivia are going to face a difficult year. The autocratic temper of its leaders is going to face increasing opposition, though of different nature. As such, depending of the nature of their inner trouble, both will require more or less help from Chavez. Lula does not seem to like either much. Correa still has the best chance to weather the coming storm since he has some economic resources. But his ambition and ideology are alienating fast the indigenous population that was crucial for his power take over. He is drifting away from Chavez more because he thinks he is hot stuff than because of real pragmatism. But his recent rapprochement with Colombia allows us to hope that maybe he will wise up.All in all, Ecuadoran diplomacy is set to remain as mercurial as its leader. Bolivia is another story. Morales has exploited the real racial divide and has succeeded in a reelection where numbers, no matter how high, are meaningless. The country is likely to drift apart, even break up, as the minority will rebel against a majority that will become inexorably oppressive and vengeful. As such Santa Cruz might be an easy prize for Brazil. The paradox for Bolivia is that the strong Morales victory is in fact a sign of weakness and a harbinger of trouble ahead.. These two countries must be treated together in spite of their huge differences. The reason is that the eventual success of Chavez and Lula in the international stage will depend greatly on what will happen there, more even than what will happen in Colombia. Chile and Peru are the two real success story of South America and as such the counter model of Brazil semi success and Venezuela open failure. The ideological challenge resides there, between a further drift to a controlling left, represented in the extreme by Chavez or in moderation by Lula, or a staid course in Liberal economics with a significant state supervision, as the capitalist world is accepting since last year crisis. Peru has been rather quiet in the international scene because its economic recovery is still fragile and because the election of Alan Garcia was rather weak. But he has proved that at least on occasion second terms can be infinitely better than first terms. His challenge is to organize a succession that will not jeopardize Peru's hard earned relative prosperity. On its borders Peru has two hostile regimes in Bolivia and Ecuador while Chile and Colombia have less access to Peru (though the never ending border problem with Chile make this country of little help for Peru). Thus 2010 will be a year of diplomatic quiet where Peru will prepare for the 2011 political transition. That is, depending what happens in Colombia and Chile. The paradox of it all is that suddenly the Chile second round presidential vote of January 17 might be a crucial moment in diplomacy for the Americas. Chile has always remained discrete in the past two decades, worrying about its growth more than anything else, and thus engaging in all sorts of free trade associations, with great success. But the second round vote will yield a new Chile. Either we will see the return of Frei who will this time be held hostage by the left and thus be forced to side more and more with Lula and, gasp, Chavez. Or Piñera will win and might become after Panama the second country not afraid to be vocal about the democratic violations in other South American countries, in particular Venezuela. Imagine what a Piñera victory means. Add to it that either Uribe or its chosen successor keep the Colombian reins. Imagine that Alan Garcia feeling more supported joins an informal front with Colombia and Chile, and a friendly relationship with the US. Suddenly the entire edifice that Chavez and Lula have tried to establish will start cracking! The calculation of Marco Aurelio Garcia and Lula da Silva was very simple: this was the time for Brazil to take over. That Brazil is in fact far from ready does not seem to have crossed their mind. And that is where sadly you realize that being a trade union leader is just not enough to make you a true statesman, even though you can still be a rather good president of your country. The statesman condition is reserved to a very few men and this year Lula has revealed himself not only to be sorely lacking it, but of being in fact a crass manipulator with little vision. It is also worthy to recall that Brazil aspires to a permanent seat at the UN security council. There is certainly a lot of merit for such a quest, but the country needs to demonstrate a certain acumen to deserve it: we are not anymore in 1945. Maybe Marco Aurelio and Lula thought that they could buy their ticket faster by controlling half a continent? The fact of the matter is that Lula da Silva has been accumulating errors, and huge ones, all through this year. There was the ganging of UNASUR against Colombia which has resulted in this one moving steadily out and possibly dragging with it Peru, and making Chile increasingly weary. Thus would die the brain child of Lula. There was the meddling of Brazil in Honduras, a place where it had nothing to do and of which it ignored pretty much everything. This only brought the antagonism of the US. And there was the obscene reception of Ahmadinejad, the contested president of Iran, the one who routinely kills political opponents, who veils its women, kills its gays. Has Lula forgot all about the Rio Carnival? the freedom it stands for? Has the trade union leader who knew jail forgotten his origins, renounced them by receiving the Teheran butcher? I think the US has seen the light. Embroiled as they are in Afghanistan and Iraq and health care and other issues the Obama administration has decided that it cannot put up with spoiled brats. This is how we must understand Uribe speedy recognition of Lobo election in Honduras fast followed by other countries. Thus started the division of the Americas in two blocks, sped up unnecessarily by Lula and Chavez mistakes. Lula gambled heavily thinking he controlled Chavez and that the US was much weaker and more friendless than it really was. Certainly not all is said, but right now Brazil is retreating unnecessarily, and grievously for its pride. The first test of this unexpected (one year ago anyway) re-arrangement will have its first test when the election of the new OAS secretary takes place. Stay tuned. So eventually I was left tonight to set up back the new template I worked these past days. At least by some quirk blogger gave me back the widgets I had installed. Still I had to restore fonts and colors and I did not get back what I had yesterday. But too late tonight to worry about that. I made a decision: I am going to forget about the 50,000 + comments of haloscan/echo. Many were excellent but it is just going to be too much of an ordeal to recover them. Besides, few people ever show a disposition to dig for old comments. For those who do, I have them backed up and with the appropriate indications might be able to retrieve them. Let's just say that with the change of year we changed to new blogger. On one side we lost a treasure of comments (I am still going to write them a last chance note) but in the other hand we get to put as many widgets as we want, including better link lists and polls. And a lighter design that still respects the intention of the old one. In addition we get rid of "the end " in blue at the end of truncated posts since now I get an automated post cutter in my editor. Small compensation perhaps but times are a changing and if I ever make a book of posts I can still scavenge for the comments of the time to include the most telling ones. Haloscan is closing and going out of my blog in barely 24 hours. The replacing system, that supposedly saves the old comments only works with the new blogger version, not the old classic one that I have been holding until now. But I have links in too many places and the look is, hate it or love it, an institution of sorts. So I chose blogger upgrade. Over the next few days I will try to recover my comments and slowly but surely recover what can be recovered from the old design (the flag is already up!). Meanwhile you can write to me for comments, or post on the blogger comment system whihc I have a feeling we might get stuck with. Most of us know how useful Wikipedia has become. We also know the many problems it faces. In spite of those problems a lot of people use it as one of their main general references online. Point 1) is about planting some seeds for future tourism in Venezuela and about helping Venezuelans know what areas beyond the main cities have or still are lacking. Are there public libraries or hospitals in Venezuelan Parapara as they are in tiny German or British towns? Do they have museums? Environmental problems?. I have been helping a little bit over the years with articles in Spanish and other languages on some regions of Venezuela, on native American languages and on Venezuelan scientists, but there is a lot to do compared to other regions. You can take a look at the articles about Carabobo (Spanish), Carabobo (German), Los Guayos (Spanish, but also in German or Russian) and Acuario de Valencia (German) and compare them with other regions in Venezuela. Venezuela is a country with terrific weather, wonderful, very varied nature and welcoming people, but it lacks a tourist infrastructure. Tourism is chaotic, the industry is mostly in the hands of adventurers. and it tends to be rather expensive. Some of the tourist operators are so-called ecourist organizations with no ecology in mind, people who settle down in national parks without permits and without contributing to the region and rip off tourists. Some regions have a lot to offer but nobody knows about them. Take a look at the pages on states, villages and scientists from the German (like Aichach) or English Wikipedia. They are not perfect but they tend to be better documented than similar regions in Venezuela. Venezuelans don't seem to put much information about public libraries or hospitals, for instance. Those libraries and hospitals are some of the most forgotten places in the Americas. We know they have hardly the resources people have in Europe. Still, we can help to make people think they are there or they should be there and are not yet. I will adopt state Delta Amacuro. I was born in a Venezuela economists used to call "Venezuela saudita", a third world country awashed in petrodollars. It was a democracy, even if it was highly dysfunctional. Back then and well into the years of increasing economic decline I used to think that even if Venezuela was very corrupt, dependent on oil and on a path to a crisis, we were rather inmune of the worst ills of other Latin American countries: military dictatorships and civil wars. There were many people who came from Argentina, Chile, Uruguay and other countries to Venezuela to escape from dictatorship. In my classroom from kindergarten through primary and secondary school there were at least a dozen sons or daughters of Spaniards, Portuguese or of Eastern European origin escaping from the dictatorships of their respective countries or from South American countries living under dictatorships. One of my best friends at high school was from Chile, another one was from Uruguay. I knew about Venezuela's past dictatorships because of what my parents would tell me: about how life was under Pérez Jiménez, the right-winged dictator Hugo Chávez admires, or about how my grandparents suffered during the Gómez dictatorship. It was only after the caracazo and specially in 1991 that I started to see the real military threat. People were fed up of the corrupt democracy we had got. Already at the end of 1991 I remember how a good friend of mine and I were discussing when the coup was coming. We were sure it would come on the first quarter of 1992. We did not have relationship with the military. We were just reading on the wall. And we were right: on 4 February there was the first bloody coup in many decades, led by our current president. Still, I did not realise to what extend we, Venezuelans, always had been prisoners of our long-standing infatuation with the military and I did not know how we were bound to repeat history because of the general ignorance about it. I always knew the Bolívar cult was over the top, but it was something I found rather kitsch and nothing more. I appreciated the good things Bolívar did do and thought the cult was something that did not really hurt, like some non-extremist religion. Every visitor to Venezuela has seen it: the omnipresent cult to Simón Bolívar, the Venezuelan who played a key role in the Independence war in South America. The highest peak, the largest state, the main avenues and squares in every city or town, countless institutions, the main airport and the currency are just some of the things called after him. Bolívar's name is everywhere. The admiration for Bolívar is not only in Venezuela, but in Bolívar's country the name is so often used that it can get confusing. There was a hat called "Bolívar" in Europe in the XIX century, a hat liberals would wear. Bolívar was definitely admired everywhere in the Americas and Europe and the many places - towns, streets, squares - called after him are a proof of this. People saw not just his opposition against the Spanish imperialism, but against slavery, against oppression of the Native Americans. It helped a lot that Bolívar died still in his forties. Still, the cult for Bolívar's has been above all a Venezuelan diseases. Already Bolívar, although rejecting the title of a king promoted the idea of a president for life. Already he declared he only aspired to have the title "Liberator of Venezuela", as if Venezuela's independence would have been inconceivable without him. I won't get into the dark parts of Bolívar's role here, but will go more into the instrumentalization of his memory and that of the other military of his time in Venezuela's history. Once the country became independent, the military who fought in the wars claimed special rights for themselves, as "próceres", as the ones who had fought with the Libertador. One of our first presidents, who was not a military, physician Vargas, had to resign after much pressure from the military demanding more power. Most of Venezuela's heads of states after that and until 1958 were military or the puppets of military. Almost every single president since the Independence declared himself a "Bolivarian", whatever that would mean. As historial Manual Caballero said in his "Por qué no soy Bolivariano" (Why I am not a Bolivarian), caudillo Monagas declared himself a "revolutionary", promoted special rights for the military (something the current president has done as well in indirect ways), claimed to revive the Gran Colombia and placed many relatives on top positions in the government, just as our current president. And he was thrown out of the presidential palace in 1858 by people shouting "Death to the thieves". 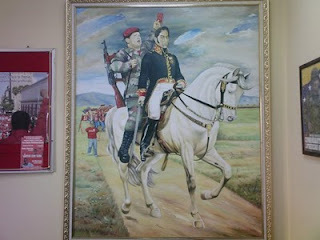 Several dictators were particularly active in cultivating the Bolívar cult but two used this new religion with particular zeal: Guzmán Blanco and Juan Vicente Gómez. Bolívar became an almost perfect figure and anyone associating himself with Bolívar became protected by this divinity. History books around the world always tended to glorify the national past or at least a part of it. Still, those in Venezuela have been particularly focused on the Independence time. It hasn't helped that many of them (Fonbona's etc) were written mostly by people who were anything but professional historians. It did not help that Venezuelans for many reasons always tended to have an abysmal knowledge of history. "Native Americans kept their language, their national dress and their national character...[but] through the introduction of christianity and other circumstances I analyse elsewhere, historical and religious heritage progressively became lost. On the other side the settler of European origin looks down upon anything that refers to the dominated nations. He sees himself in the middle between the ancient history of the motherland and the one of his birth country and he is as indifferent to one as to the other; in a climate where the small difference between seasons makes the passing of the years almost unnoticeable he only dedicates himself with enjoying the present and he seldom looks back to past times"
Der Eingeborene hat seine Sprache, seine Tracht und seinen Volkscharakter behalten..durch die Einführung des Christentums und andere Umstände, die ich anderswo auseinander gesetzt, sind die geschichtlichen und religiösen Ueberlieferungen allmählich untergegangen. Andererseits sieht der Ansiedler von europäischer Abkunft verächtlich auf alles herab, was sich auf die unterworfenen Völker bezieht. Er sieht sich in die Mitte gestellt zwischen die frühere Geschichte des Mutterlandes und die seines Geburtslandes, und die eine ist ihm so gleichgültig wie die andere; in einem Klima, wo bei dem geringen Unterschied der Jahreszeiten der Ablauf der Jahre fast unmerklich wird, überläßt er sich ganz dem Genusses der Gegenwart und wirft selten einen Blick in Vergangene Zeiten. The native American, the European and the African slave all merged into the average Venezuelan of today, but we still show either a complete disdain for history or love for one part of it, the part we identify ourselves most with. You will find most Venezuelans with some e ducation know Bolivar's birthday and death anniversary. Most of them would not know in what century the Europeans arrived in Venezuela or what reactionary tendencies Bolívar had. And it is in that framework that Venezuelans have evolved. As the economic situation of a nation highly addicted to petrodollars deteriorated, a group of military pretending (and sometimes really believing) to defend some nebulous Bolívar heritage prepared the bloody coups of 1992. Hugo Chávez has taken the Bolívar cult to new heights. He needs that. He single-handedly renamed Venezuela in 1999 by adding the "Bolivarian" (in spite of the fact that the approved constitutional draft had taken away that proposal of his). That is why the current president can say Indians were almost socialists and all were equal and most of his followers believe that or that we are mostly a native American and African-American nation (the European part being mostly that of the opposition). Now take a look at these maps. In the first one you see Venezuela's states. The largest state , in cyan, is called Bolívar. The states in red have been called after military from the times of the Independence movement. 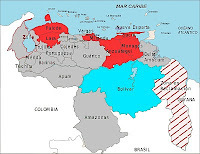 The following map shows the municipalities Venezuela has. Municipalities in cyan are called Bolívar or Simón Bolívar. 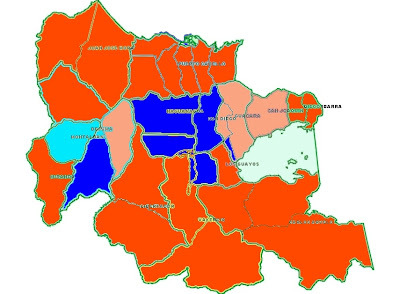 Municipalities in dark blue are called Libertador (referring, of course, to Bolívar). Those in red are called after military who fought in the Independence war. The ones in yellow are called after other military. In future posts I will go further into the way Venezuelans process their history. Municipalities named after Venezuelan military caudillos. 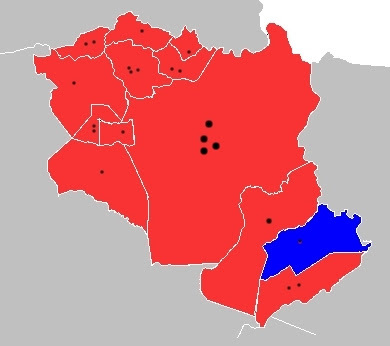 In cyan those named 'Simón Bolívar' or 'Bolívar', in dark blue those named 'Libertador' (i.e. Bolívar), in red those named after other military men of the Independence time, in yellow those named after military men of post-independence times. Rafael Caldera, twice president of Venezuela (69/74 and 94/99), passed away just before Christmas. I am no fan of the man those no eulogy from my side. I will only recognize in him his civilian values and that he managed successfully the first democratic political transition in Venezuela history. Until Caldera transitions were always violently contested and never finished their term, starting with Vargas in 1834 (all historical parameters taken into account!). Caldera together with Betancourt and Villalba understood that democracy in Venezuela would be possible only when political opponents would be looked upon as mere opponents and not as enemies that had to be destroyed. That was the foundation of the "Pacto de Punto Fijo" who brought to Venezuela 40 years of civilian discourse and democratic culture. That is why chavismo is so bent in discrediting these years as chavismo is a throw back to the era of violence and segregation that existed before 1958. But together with Carlos Andres Perez, Caldera suffered from the reelection bug. He went as far as wrecking the political party he founded, COPEI, when this one did not want to give him the nod for reelection. As such his return to power was ensured by him riding the consequences of the 1992 Chavez murderous coup and accepting to preside over an electoral alliance including small and/or unsavory parties, most of them finding their way to Chavez in 1998. Trapped in his own discourse, and probably feeling threatened by the military, he gained time to finish his second term by allowing Chavez go unpunished from the murders of 1992 and thus allowing for a military regime to take office through the vote in 1998. Today Venezuela is a military regime and in my opinion Caldera is one of the main culprits, if not the main one when we put him with Alfaro Ucero. At least his family had the good sense to refuse state honors from the regime they helped come to office. Not that much honor would have come anyway if we look at the dismal treatment offered Herrera Campins when he died. But what can you expect from the vile uncouth soldiers controlling Venezuela? You can find in Spanish a summary of Caldera's life here.